Written for the teenage and adult market to improve shared understanding, the lively illustrations together with the words in this book can enlighten and inspire its readers. 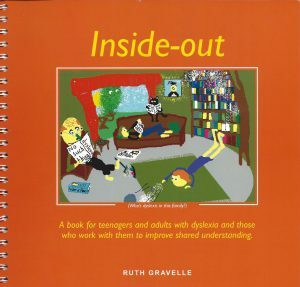 ‘Inside-out’ describes aspects of dyslexia through pictures and words; showing how it can feel to experience this type of learning difference; helping people to understand their experiences, recognise their potential and inspire them to develop further skills and strategies to cope. I teach dyslexic students from age 5 – 18. I’ve used this book to help them see that they are not alone in the difficulties they experience. For example one pupil recently asked why it was that he could learn words and spell them correctly for a spelling test, but then not spell them correctly on the same day when writing a story. I showed him a page in this book to help explain why – marvellous! I am always on the lookout for books and tools on dyslexia to help my very bright but severely dyslexic 17 year old godson, and bought this one recently – and I don’t think it’s putting it too strongly to say it’s really changed his life. For the first time, he says he didn’t feel lectured or put off by big blocks of text or difficult language; he “got” the artwork and became extremely enthusiastic that someone (the author and illustrator) really understood how it was for him – apparently she is herself dyslexic. He’d always had problems at school because despite being diagnosed dyslexic, he still considered himself educationally subnormal, and so dropped out after failing all his GCSEs – but now feels inspired to test himself by taking an NVQ course at his local college – an inspiration he credits to this little book. Not so little if it can have that effect! Bought on a whim but worth its weight in gold. Highly recommended. Dyslexia is the topic of conversation with my guest Educational Psychologist Dr Sue Warnock who worked for the former Dyslexia Action's Chelmsford Learning Centre. Sue continues to assess in Chelmsford, Essex and in the a East Midlands. The work of the Multi-Sensory Training Centre at Colchester is discussed with my guests Dr Annette Grounds – Behavioural Optometrist, Hayley Green – Primitive Reflex Specialist and Dan Edwards – Dispensing Optician and partner at Patrick & Menzies. My guest is Jo Hockey from Headway Essex, a charity providing brain injury care and support. Headway Essex is always on the look out for volunteers, please get in touch with them if you can help. Brain injury awareness week is promoted by Jo Hockley from Headway Essex and Melissa Parker. Melissa experienced a brain haemoridge in 2011 and has been connected with Headway since that time. She describes some of her experiences and how her life has changed since 2011. Interviewing Professor Bruce Evans, who works as an optometrist based in Shenfield. He is author of Dyslexia and Vision (2001, Whurr), and Vision and Reading Difficulties (2010) for opticians. Iain Blake-Lawson is my guest from South East Essex Epilepsy Support Group. Ian informs us about the issue of epilepsy, describing some of his personal experiences and telling us how people can access information and support in Essex. Gary Atkinson interviews Ruth Gravelle. Ruth describes some of her strengths and challenges growing up with the dyslexic learning differences and makes links with her present work as a dyslexia specialist, hypnotherapist and volunteer radio presenter. My guest Deborah Smith describes mindfulness, positive psychology and her research in this field. Deborah offers some great examples of her work, including how the practice of a loving kindness meditation helps children in schools. We talk with Tom Mawdsley, a judo black belt and member of Paralympic Team GB. He describes some of his experiences of living with Asperger Syndrome (ASD), his education, work, socialising, judo and his hopes and dreams. is the topic of conversation with Ruth Gravelle's guest, nutritionist, author and TV chef Juliette Bryant. Starts 6 minutes in. My guest is Gary Atkinson. We talk about Rupert Sheldrake, a biochemist and author whose theories are considered somewhat controversial by the mainstream science, including his book The Science Delusion. will be the topic of conversation with Julia Magnay from Live Enriched. Supporting disabled and disadvantaged young people with special needs and their families, is the topic of conversation. Ruth Gravelle interviews InterAct employees Susie Nankivell, Lucy Hazell and Ali Perrett. InterAct, amongst other things, supports families to complete applications for Education, Health and Care Plans (EHCP). The work of Create & Flourish is the topic of discussion on this radio show. My guests are Triss Norman and Sharon Chan who work in creative ways to enable adults to improve their mental and/or physical wellbeing. They run Create and Flourish based at Burnham on Crouch, supporting people across Essex. is described and discussed along with topical music such as, 'The Drugs Don't Work' and 'Lily The Pink'. Ruth's guest is Gary Atkinson who has been investigating some of the research and outcomes of using placebos. These have been across a wide range of applications and how the findings place new challenges upon modern medicine. Identifying what triggers our natural ability to heal is of great interest.